Rental of the electrical hotbox does not come with any pans to operate the unit. Customer is responsible for sourcing and providing their own sheet pans for the hotbox. The unit cannot hold regular chafer pans and will only accommodate sheet pans. There are 32 slots for pans but you will need to be mindful of height that the chafer pans or whatever you choose to hold food will take up. 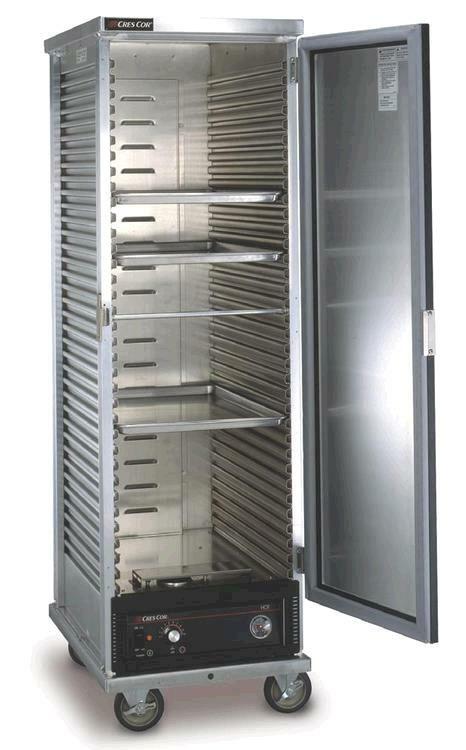 Consistently voted "Best in Class," the versatile holding cabinets from CresCor have a highly efficient design to hold prepared food items at safe, proper serving temperatures. Heavy duty 5" swivel casters- two with brakes- provide these durable cabinets great mobility when fully loaded. * Corrugated sidewalls securely hold 18" x 26" pans on 1-1/2" centers without tipping. * Powerful, yet efficient, heating system maintains the right combination of heat and humidity to properly hold products. 1500 Watt heater holds foods at up to 180 F. (82 C.). * Body constructed of non-corrosive, Hi-Tensile aluminum with extruded frame fully welded for strength and ease of mobility. * Controls accessible without opening door; allows adjustments without interrupting process. * Slanted control panel has easy-to-read thermometer; entire assembly removable for cleaning and maintenance. * Please call us with any questions about our hot box electric serving Cary NC and Raleigh NC, Chapel Hill, Pittsboro, RTC & Raleigh-Durham in North Carolina.